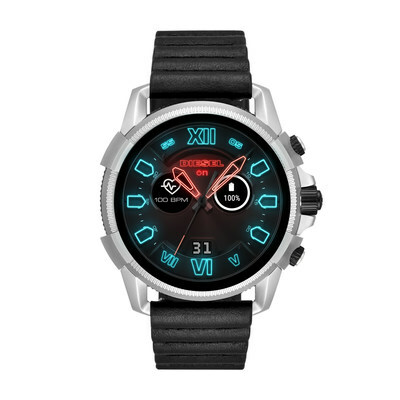 MILAN, Aug. 30, 2018 /PRNewswire/ -- Diesel pushes its wearable technology to the limits with the launch of the brand's premium Full Guard 2.5 touchscreen smartwatch. The next generation smartwatch offers the latest and greatest in wearable technology, including heart rate tracking, NFC payment capabilities, and GPS tracking. Wrapped in Diesel's signature bold, moto-inspired design, the new smartwatches signal to the world that fading into the crowd is not an option. Steve Aoki – global superstar DJ, producer and Diesel’s newest ambassador – will be the face of Diesel’s Full Guard 2.5 touchscreen smartwatch. The next generation Diesel Full Guard 2.5 touchscreen smartwatch offers the latest wearable technology, including heart rate tracking, NFC payment capabilities and GPS tracking. Optimized features include rapid charging, music control, customizable watch faces, smartphone notifications, Google assistance and swimproof functionality. Heart Rate Tracking: automatically track your heart rate across multiple types of workouts using Google Fit or third-party apps*Tic Health available in China. Payment Technology: make purchases via your NFC-enabled smartwatch using Google Pay*Alipay available in China. Google Pay available in select countries. Assist on the Wrist: ask questions and give commands directly to your smartwatch via Google Assistant*Mobvoi Assistant available in China; Google Assistant available in select languages. Swimproof Technology: shower and swim up to 3 ATM seamlessly through third-party apps*Mobvoi Store available in China; Google Play Store available in select countries.